Offering you a complete choice of products which include servo universal testing machine, hydraulic universal testing machines, mechanical universal testing machine, pc control universal testing machines, digital universal testing machines and computerized universal testing machine. 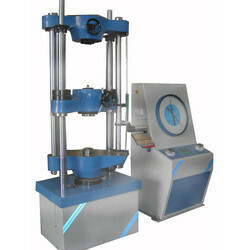 We are leading manufacturer of Servo Universal Testing Machine and our product is made up of good quality. KUS series is a family of Servo-drive controlled screw driven innovative force measurement systems. These machines are available in table top / floor mounting models with different load capacities from 0.5kN to 100kN. The robust design is ideal for general purpose force testing demanding high-volume production testing. For detailed research and laboratory purpose, the precision measuring systems are incorporated into the machine. 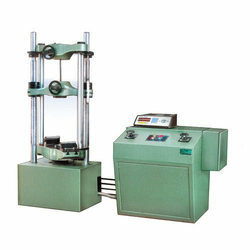 We are the Manufacturer of Mechanical Universal Testing Machine which is designed for High Tensile TMT Bars. Load Measuring: A pressure transducer attached to the hydraulic pressure line measures the load at a resolution of 0.1kN, with auto-ranging facility. Displacement Measuring: A rotary encoder (available in 0.01 or 0.001mm resolution) measures the cross head displacement. For tensile test a high precision Extensometer is used to capture the true elongation in the specimen. It is available in different gauge-lengths from 20 to 200mm. Krystal Met Software: Krystal Met - an user friendly Windows based software captures the test data and stores in the database for an extensive analysis of the test. An online graph of load vs displacement/extension gives user a clear picture about the test in progress. A report with various test results and graphs can be printed or exported to PDF or Excel format for easy sharing with other parties. Krystal Met gives a complete batch analysis report to understand the behavior of samples in a batch. Most simple and Easy to use. Large Dial type Load Indicator with Dual Pointer. Equipped with Auto Load Selector. Equipped with Graphic Recording Attachment. Hydraulic Power Pack to develop adequate Hydraulic Pressure to be applied on the specimen under test. Flow Control Valves to smoothly control the rate of loading. Electrical controls for Hydraulic motor and Crosshead motor. Autograph assembly to draw an “On-Line” graph for Load Vs.Displacement. 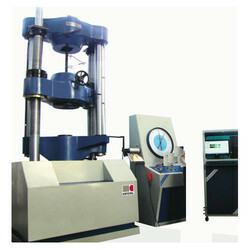 PC Control Universal Testing Machines is designed and developed in-house at Krystal. Special grips and the hydraulic system is implemented to withstand high load. Easy data feeding through Sealed Membrane type Keyboard. Variety of Graphs and Report printing. Electronic hardware for Interfacing measuring system for with Digital display for load and displacement. Built in parallel port for Dot - Matrix printer. Can be upgraded without major hardware charge. Tensile test on metal, synthetic material etc. Bending / transverse test on beams, synthetic material etc. Shear test on metals, polymers etc. 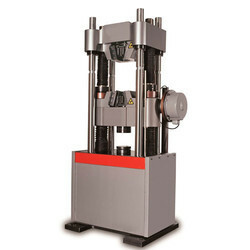 Computerized Universal Testing Machine is designed and developed in-house at Krystal, 200Ton capacity Universal Tester is specially built to test extremely high tensile strength TMT bars. Special grips and the hydraulic system is implemented to withstand high load. Equipped with KrystalMet_4.1 Software for Material Testing, this machine records critical data like Young's modulus, capturing automatic yield etc. with extensive reporting. Windows Based Click and Go Software Package. Supports Tensile, Compression, Bending and many more Tests. Compensated for main screw clearances and frame stiffness. Windows Based Software for Displaying and Analyzing Test Results. 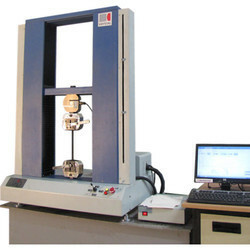 Configured for Variety of Tests like, Tensile, Compression Transverse, shear etc. Upper Crosshead connected to machine table through plane columns. Main screws for adjusting and controlling position of middle crosshead.